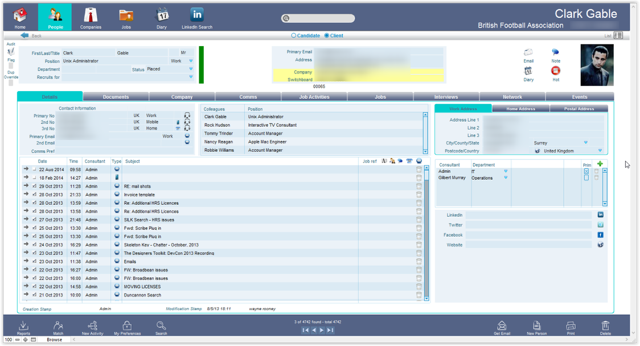 People - List View contains People by Unique ID, First Name, Last Name, Position, Company, Phone, Salary, City, Email address, Original CV stored and Exclusion from Mail Merges. Form view always displays the name, address, employer, telephone and email address information for the person at the top. 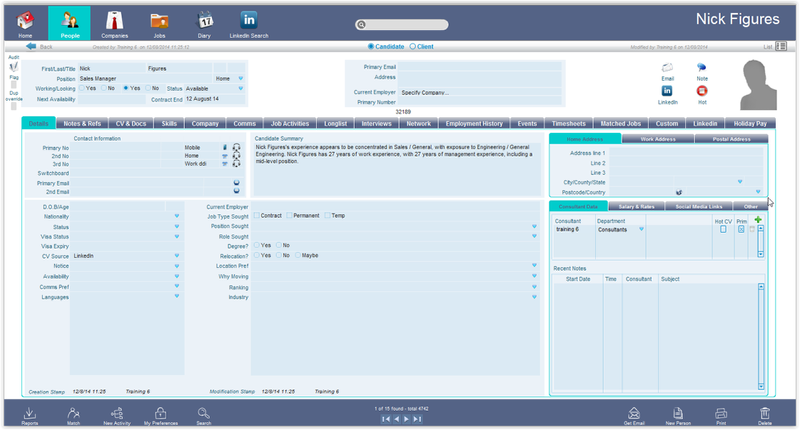 This tab contains personal, address, current employer, job type sought, salary details and social media links. This tab contains Consultant Notes and Reference information. This tab contains a copy of the person’s Original CV in the CV Text window, storage areas for the original CV and formatted CV and storage space for other document in the bottom right hand list. This tab allows you to bring through custom categories and fields that are set up in the Admin section of the database by clicking the green +. These fields can then be populated using yes/no, a ranking number, a text value and notes. This tab shows you a live preview of the person’s LinkedIn profile and highlights any fields on the right hand side that differ from the details on the person’s record. This tab show you details of the candidates Holiday pay. Form view always displays the name, address, company, telephone and email address information for the person at the top. This tab contains contact details, address, position, colleges, social media links and a communications summary. This tab contains a copy of any documents and storage space for other document in the bottom right hand list.